From the entrance there is access to the bathroom with a combined washer / dryer. The kitchen overlooks the edge of the garden and access to the covered wooden terrace with terrace heaters. In the northwest corner of Zealand is also called "Odsherred". The cottage is located on the water side of the road between Nykøbing Zealand and Rørvig. 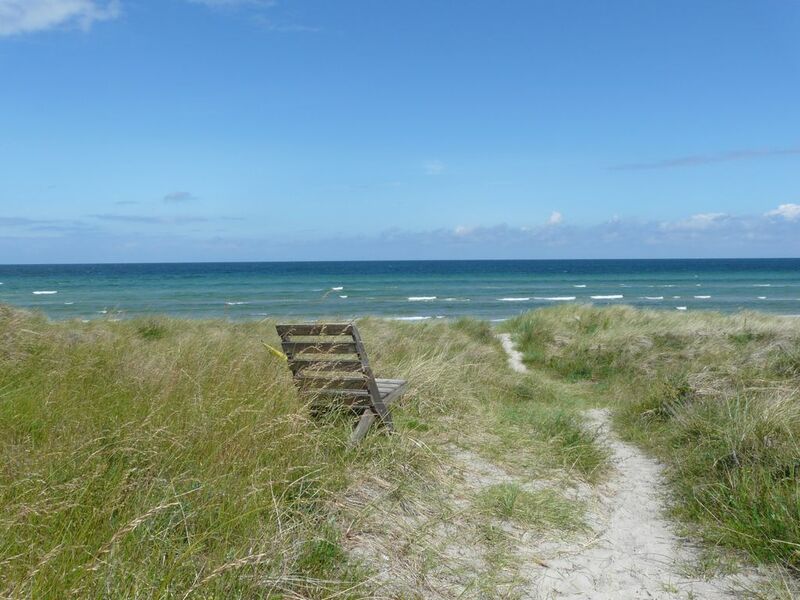 From the house there are 800 m to a beautiful sandy beach, 4 km to Rørvig and approx. 2.5 km to Nykøbing Sjælland center. Rørvig is a lovely little town with marina and ferry to Hundested. The city is filled with life the summer through. At the harbor, the kids can have hours to go with nice crab fishing and playground. There are ice cream shops, fish shop, food and drinks with lovely views of the fjord, the harbor and the small ferry port. In Nykøbing Zealand you will find the area's best shopping, pedestrian street with shops, theater, cafés and restaurants. In Nykøbing Zealand there is also a marina situated beautifully against the fjord, where there are several handicrafts, playground and an ice cream shop. Birdwatching - Hov Vig Neck with marked routes for both cycling and hiking. Sandy beaches in the area are very nice and child-friendly, with dunes and clean bathing water with blue flag. The nearest beach is only accessible by bike or on foot, so it is very quiet and always plenty of space. The nearest beach you can drive by car is only 2 km away. The whole Odsherred is an geopark and is under UNESCO's protection. There are many events in Odsherred. Visit for lots of good information. Vi kom nylig hjem fra en 6 dagers ferie i denne flotte hytta. Det er ikke en vanlig utleiehytte, men en hytte hvor man får følelsen av å være hjemme og bærer et personlig preg. Utleier er en veldig hyggelig mann som forklarer alt om hytta og vi kunne bruke alt fra utendørsleker til lekene på barnerommet, WLAN, TV, gassgrill osv. Det manglet virkelig ikke noe på kjøkkenet. Det var til og med spisepinner til barn! Vi satte også pris på det lille ekstra ved at det var toalettpapir, toaletthåndkle, håndsåpe, drikke i kjøleskapet og snaks vi kunne ta av fram til vi kom oss i butikken. Sommerhytta er helt ny og rein samt at den er gjennomtenkt til hver minste detalj. Interiørmessig flott med preg av moderne dansk design. Utvendig en stor flott hage uten innsyn og rolige omgivelser. Alt ved bookingen var ukomplisert og utleier svarte fort på henvendelser. Alt i alt særdeles bra. We had a beautiful week in Nykobing with our 3 kids. A beautiful, cosy, 'hygge" house, everything was brand new, in the kitchen was everything you need available and there were some fun toys for the kids, nice garden and near a quiet beach. With our bikes we were in a few minutes at the beach and you can easily make larger bicycling tours. We visited Roskilde and lovely Copenhagen. We recommend this house to everyone! !